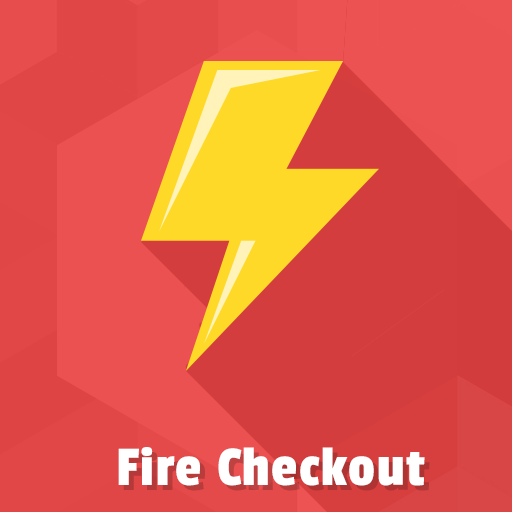 If you are looking just for our Fire Checkout module and not interested in our Extension Club offer then please check our new official Fire Checkout website for both Magento 1 & 2 versions at Firecheckout.net. We know what it takes to go through multiple checkout steps and still complete the purchase. We know what you stumble upon every day in order to win sales. 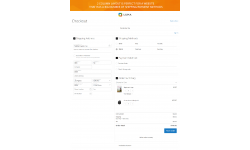 After all, we are ready to suggest you the advanced solution in order to help you bring the most enjoyable checkout experience to your customers. 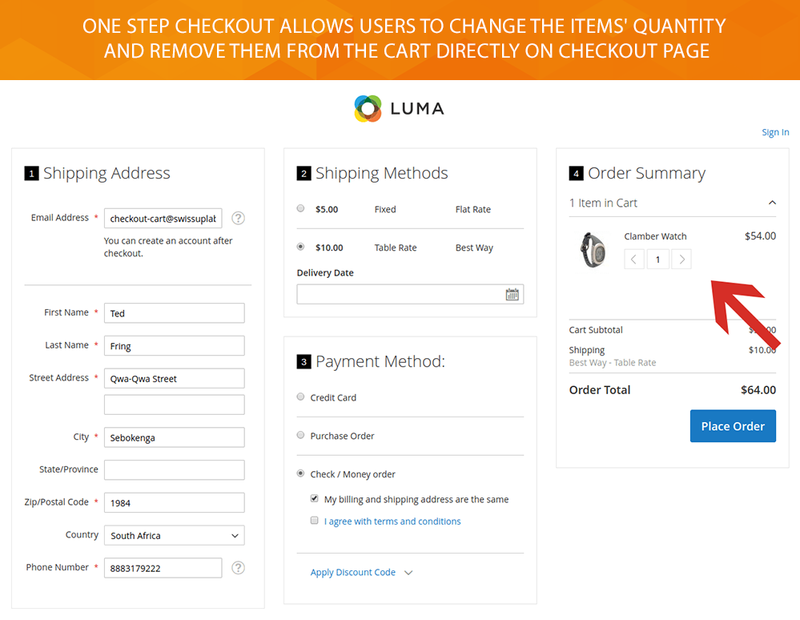 Speed up the purchase complete by providing users with one page checkout. 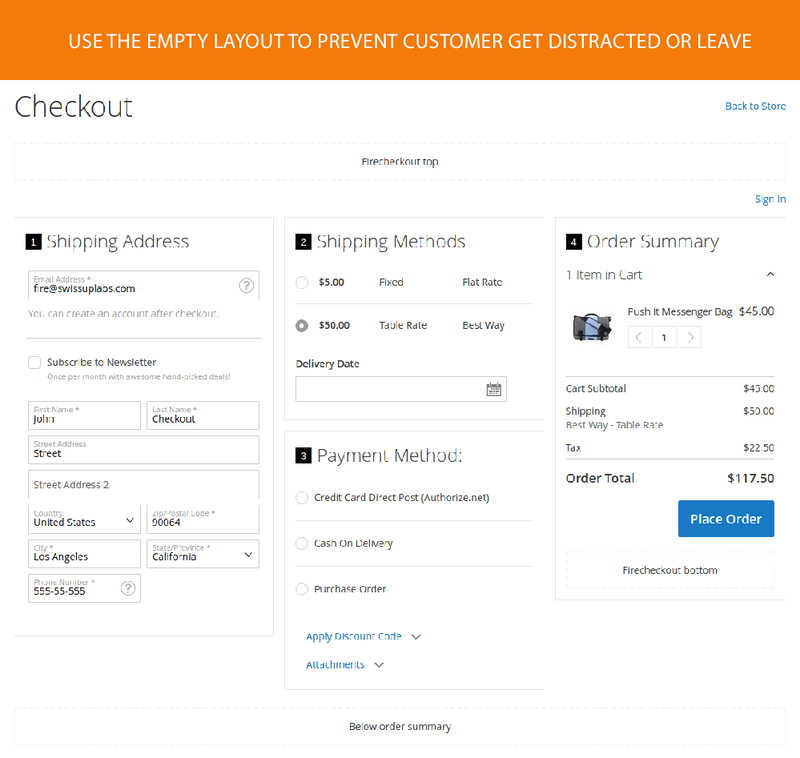 Decrease a shopping cart abandonment. Get highly effective in boosting a conversion. 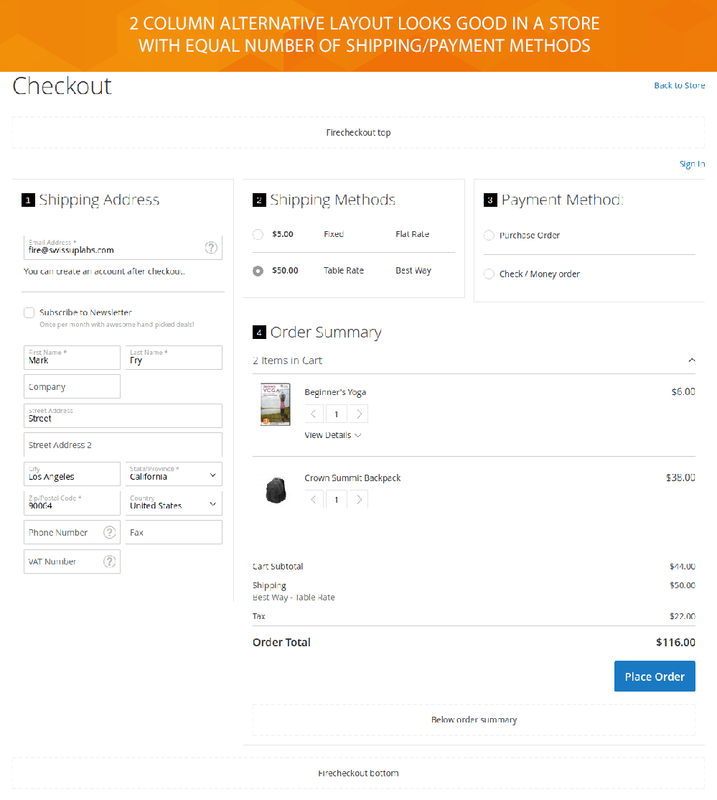 Everybody’s favorite FireCheckout for Magento 1 has more than 5000 satisfied clients all around the world. Now you have a good opportunity to deal with Magento 2 enhanced performance. 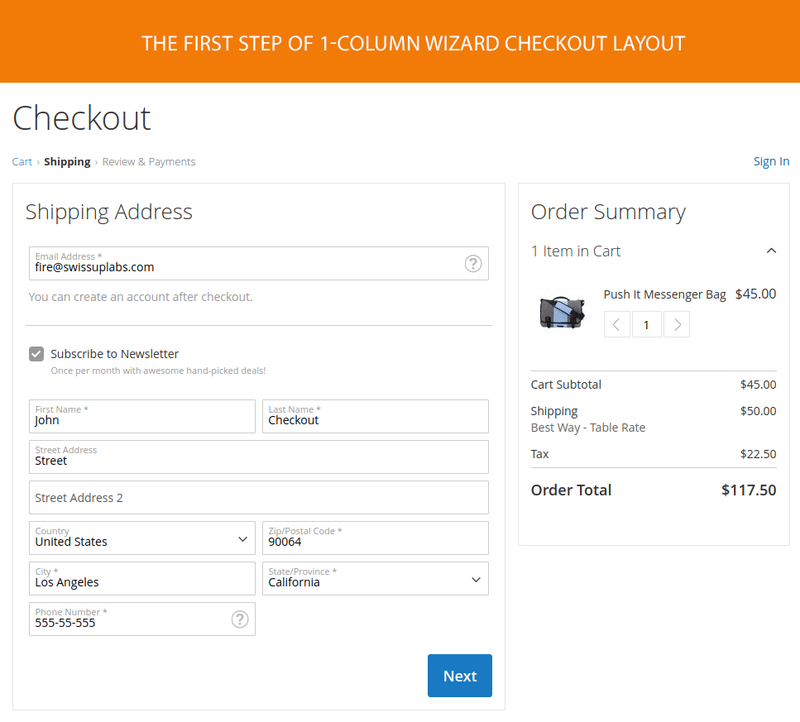 With M2 One Step Checkout you receive the top Magento 2 features for admins and a streamlined checkout process for your customers. Say No to complex steps and boring page loading. 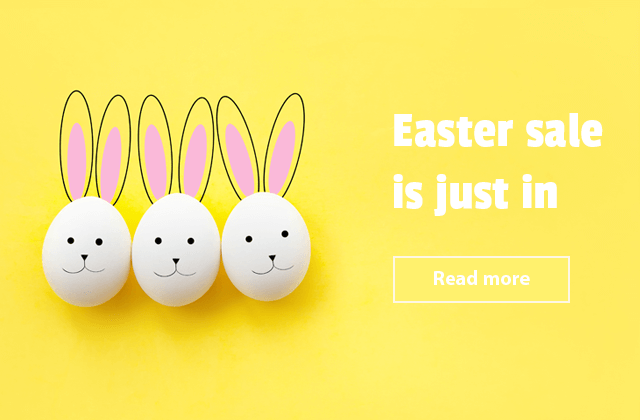 Say Yes to 4 incredibly convenient layout types and modern responsive design! 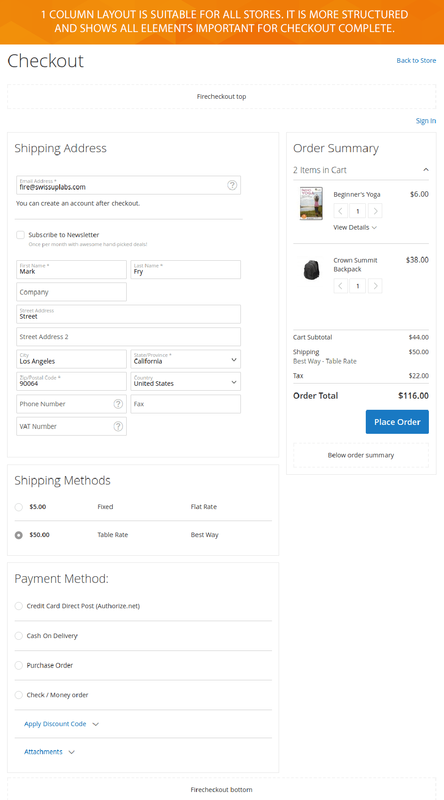 Try out one page checkout module for Magento 2 and make your customers very much satisfied with your store service. 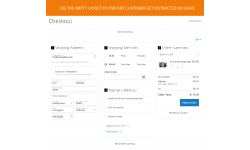 One step checkout extension is available in 4 layouts. 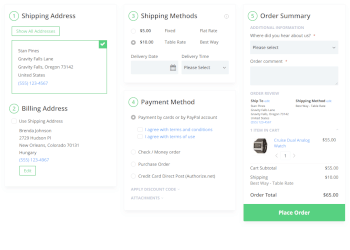 If you are running a store with an average number of shipping/payment methods, you can choose a smooth 3-column layout. 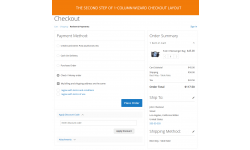 Two columns layout is perfect for websites that provide users with a larger number of shipping/payment methods. Another one is an alternative 2 column layout. 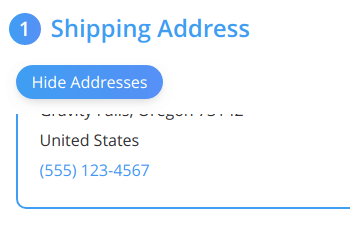 You would probably like it if the total number of available shipping methods is equal to the payment providers number. 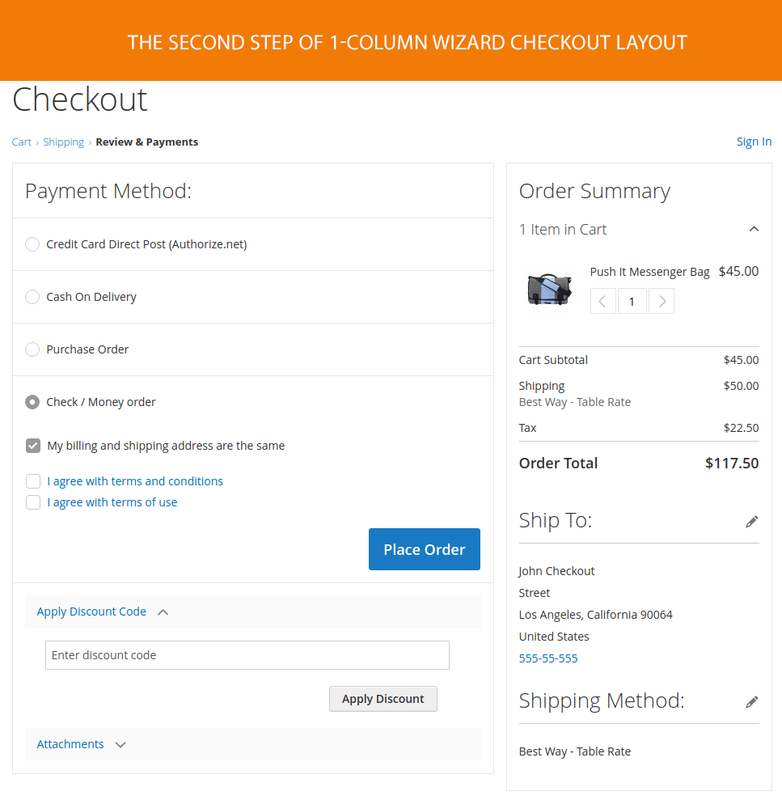 You can also choose 1 column expanded layout that is suitable for all Magento 2 stores. 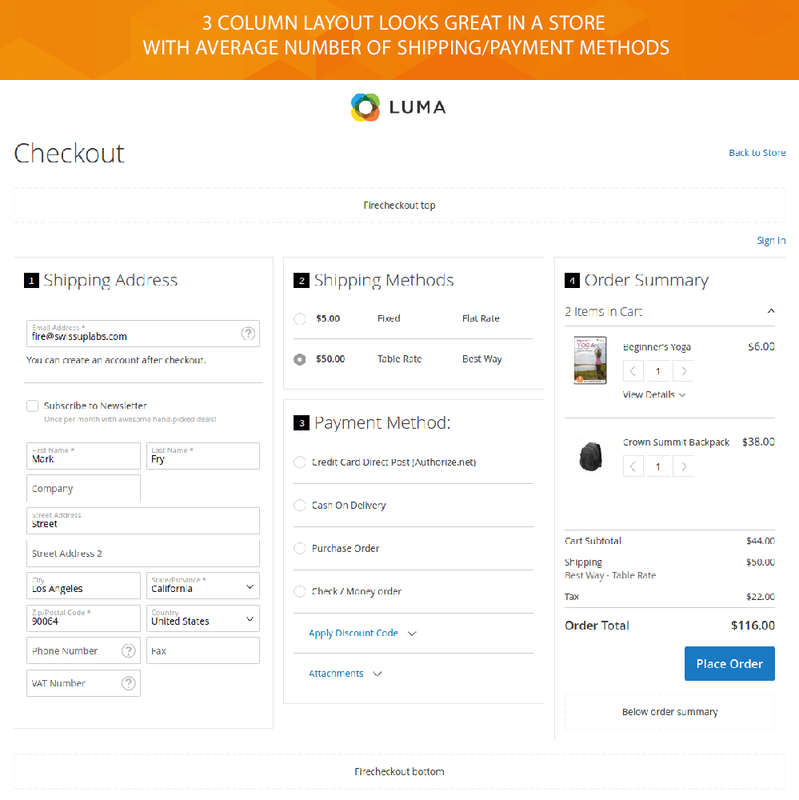 All checkout layouts are well-designed and look amazing in any screen resolution. 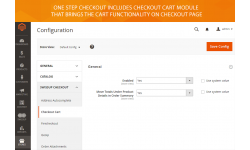 Magento 2 checkout extension comes with Success Page module. 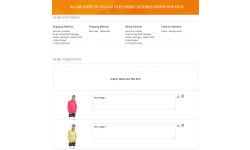 This powerful combination allows you to show more information on Magento order confirmation page. 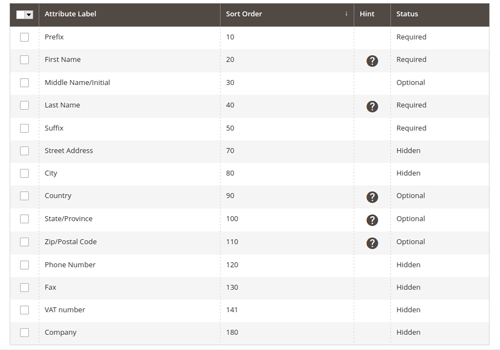 Via the configuration, you can add 2 static blocks with additional content above or below the order information. 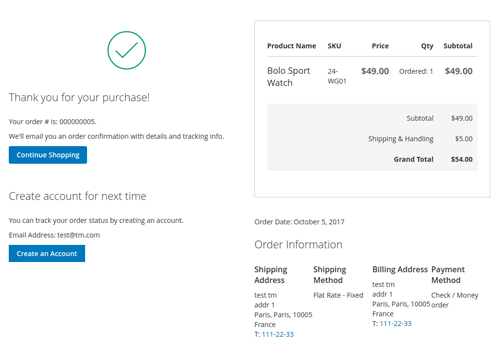 Thus you can show the list of the ordered products, billing and shipping information details or even any other promotional offers. 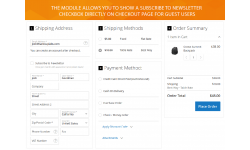 The module comes with friendly drag-and-drop backend interface. 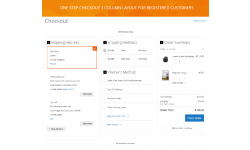 You can easily preview a checkout success page from admin. 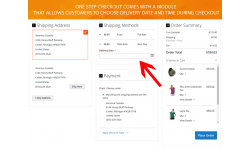 Furthermore, the module enables quick customer registration directly on checkout success page. 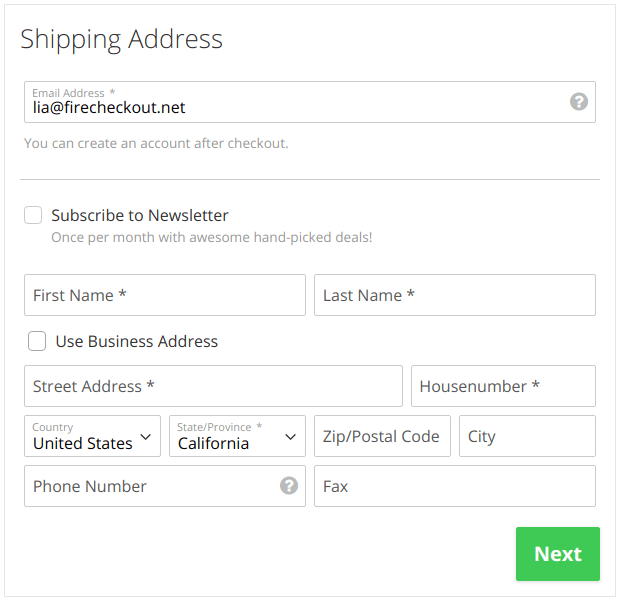 Improve the user experience with GeoIP functionality built on the checkout page. The included GeoIp feature supports the Country, Region and City databases of MaxMind library geolocation. That will help you to detect a visitor current location based on his IP address. 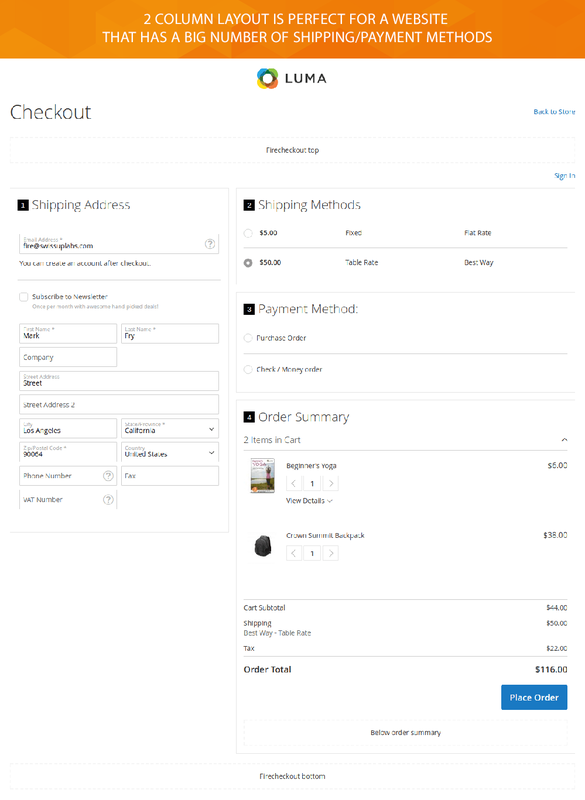 Thus your visitors will see the already prefilled main checkout address fields. 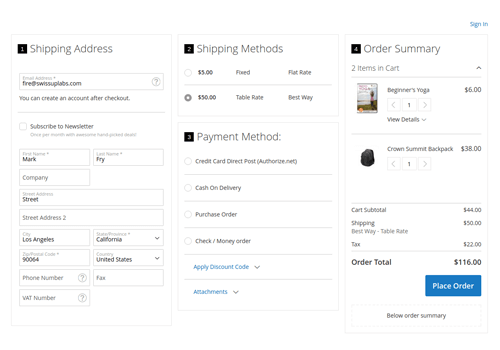 The fewer steps are to fill, the faster checkout will complete. 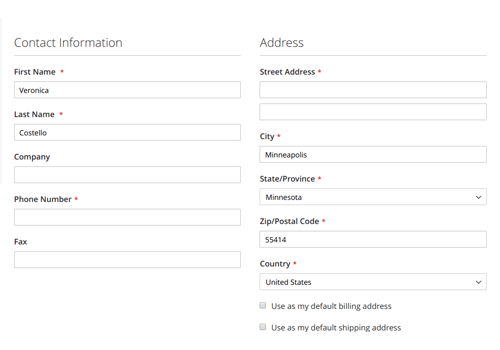 Our extension includes the Address Autocomplete module that is based on Google Maps API features. 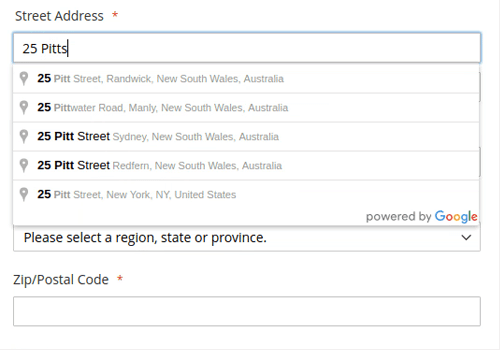 Once a user starts typing a street name or a number, he will see a drop down with possible addresses list. 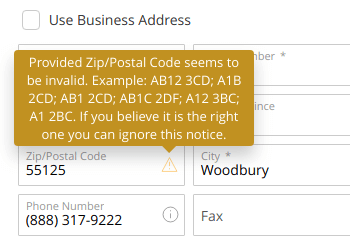 With address auto-filling feature your customers will complete the address line with a single click. In the configuration, you can choose 3 types of street number placement. That will ensure the proper output of user address in the address line. 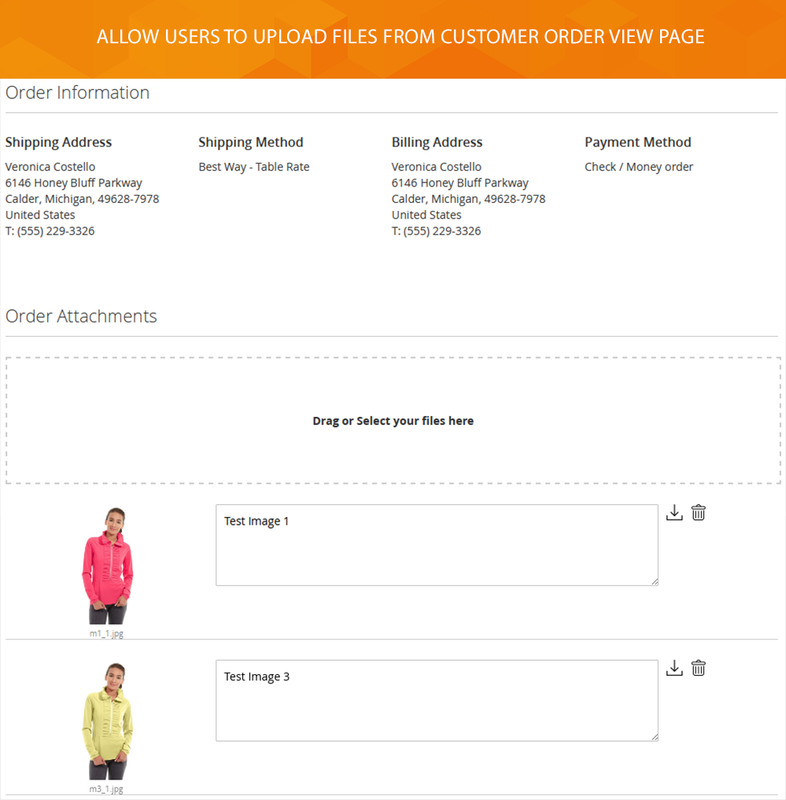 With built-in Order Attachment module, you will help your customers to upload the files during a checkout and on Order View page without reloading the whole page. 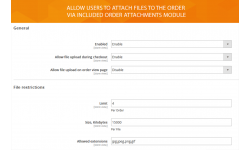 All attached files are protected from a public access with generated links that can be added to the email template after. This module is also valuable for your store admins. 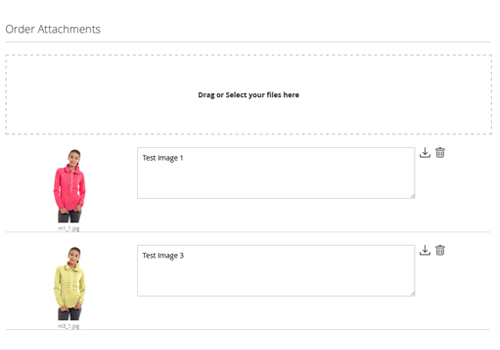 You may edit the attachment comments, upload new attachments or delete them. Via extension configuration, you can set the allowed file extensions, the maximum file size, and number. All the order information is stored in the same place. 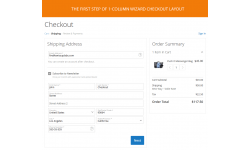 In order to comply with EU VAT regulations, you can use the Checkout VAT module built in Magento 2 one step checkout extension. 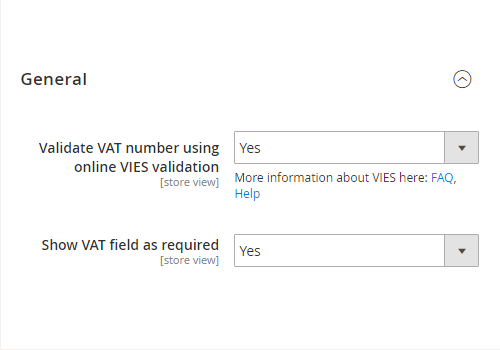 Now you have a good opportunity to help your customers to verify the VAT number by using a VIES validation service. Checking an order for a valid VAT number is truly important in the European Union. Checkout VAT module allows you to enable the Tax VAT validation field in checkout shipping and billing address forms. 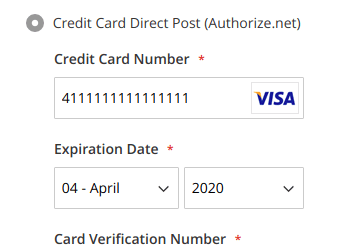 You can set this field as required or not. 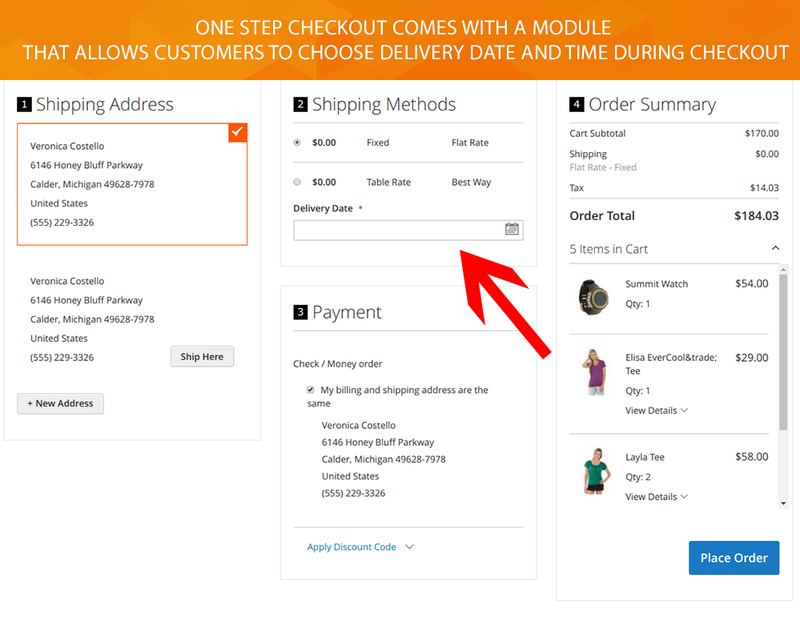 The delivery date and time module will help you to prevent the delivery issues. 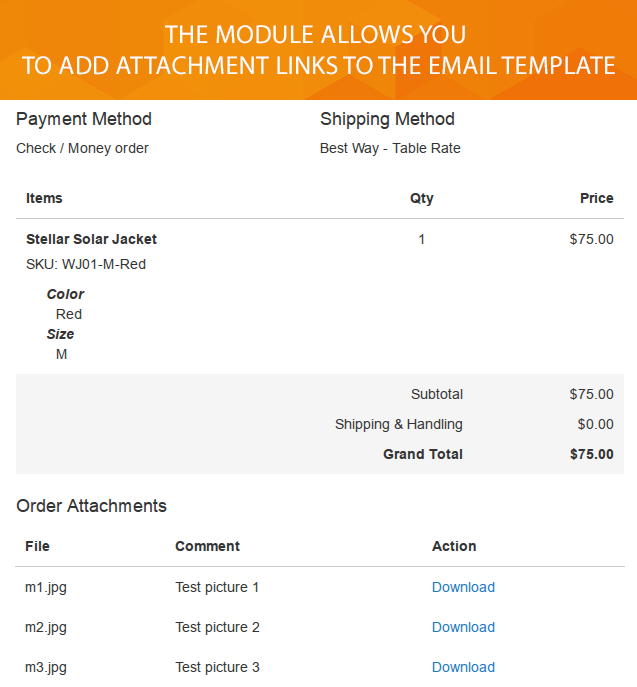 Therefore our module comes with advanced delivery date configuration. 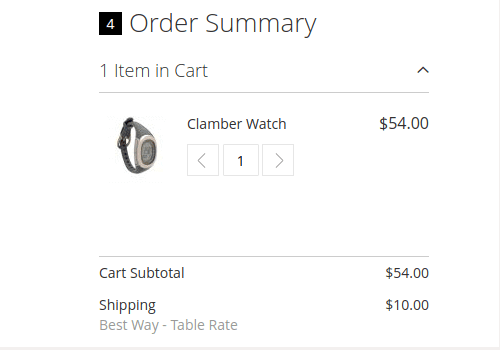 Now your customers can set a delivery date and time during checkout, choose the time to exclude a delivery, use a calendar, pick the delivery options only for separate shipping methods. 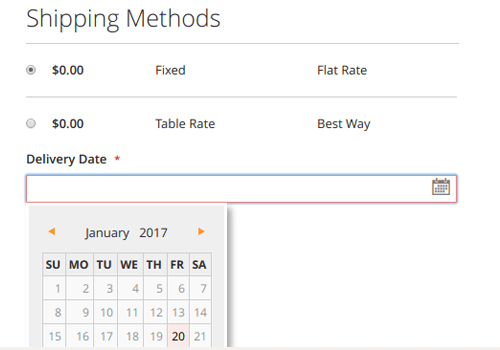 The module allows you to show a list of holiday dates or set a weekend in order to exclude a possible delivery. 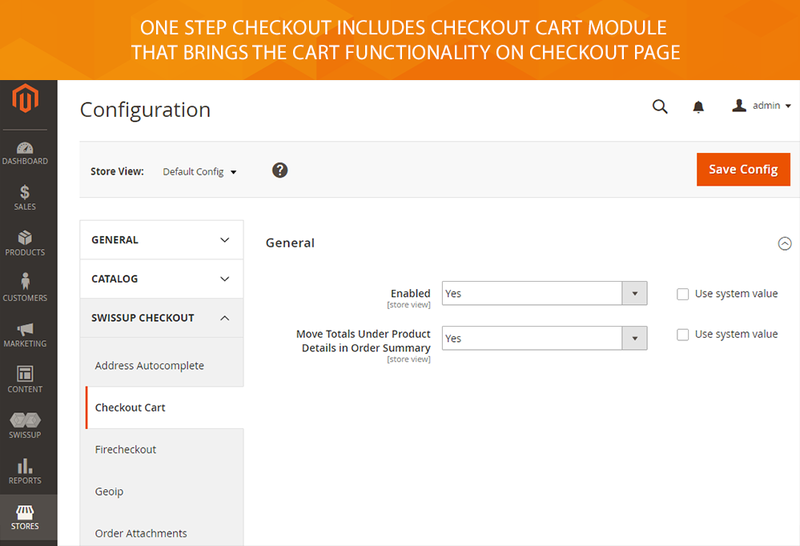 Checkout Cart module built in One Step Checkout extension will help you to bring the shopping cart functionality to the checkout page. 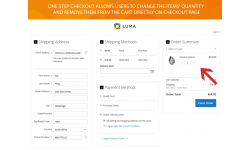 Actually, this module allows users to change the items' quantity as well as remove the products from the cart directly on a checkout page. 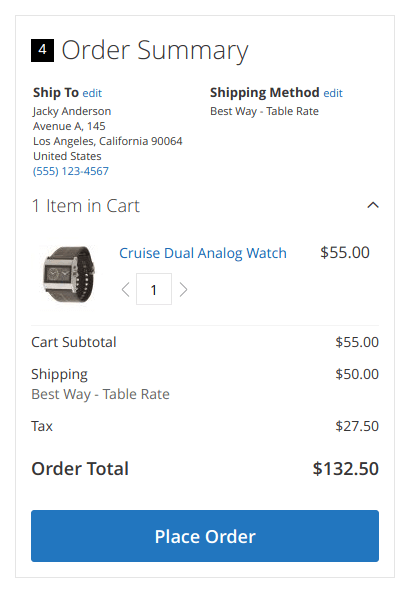 Via the module, you can also move the totals block under the product details in checkout order summary. Using the plus/minus symbols instead of arrows is available. 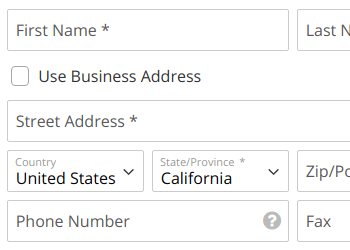 Our extension includes the Address Field Manager module. 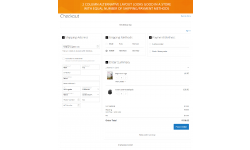 Now you can easily manage the customer checkout address fields via store admin interface. 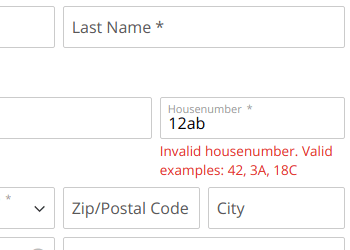 The module allows you to swap a sort order of address form fields as well as set a status to the required or hidden without changing a status for the name fields. Address field manager extension provides you with a flexible and easy to use interface. In order to change a value, you can enter the corresponding values into inline edit form or select multiple rows and press “Edit” button. 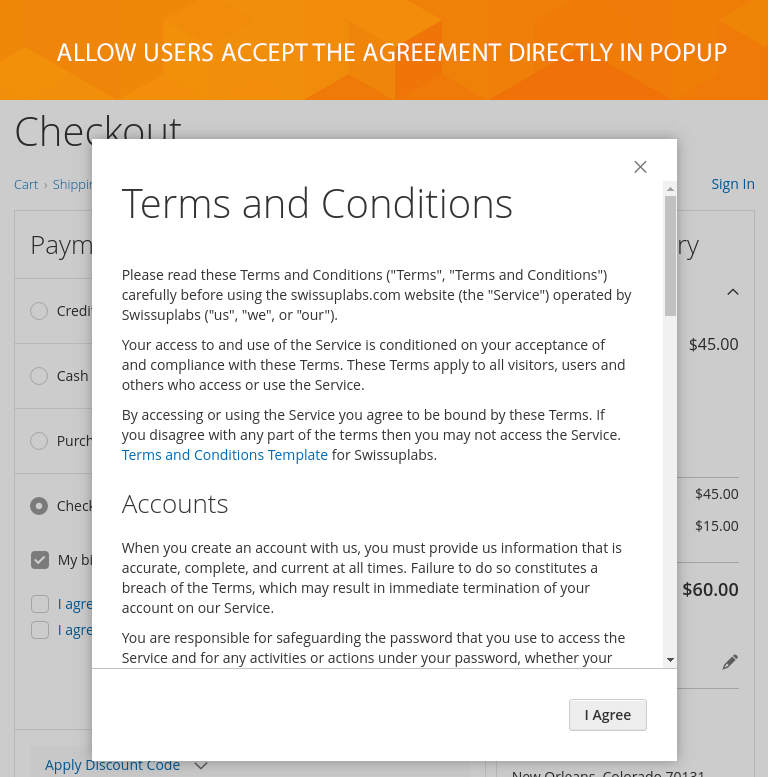 Our extension comes with Checkout Fields module that enables a display of the additional fields with custom content right on a checkout page. 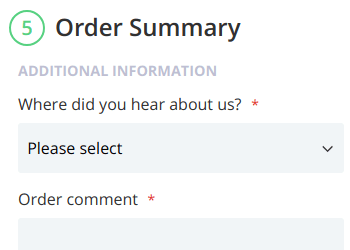 So, you can ask “How do you hear about us” or “Would you recommend the products” to know the most important things that users can say about your site or order. 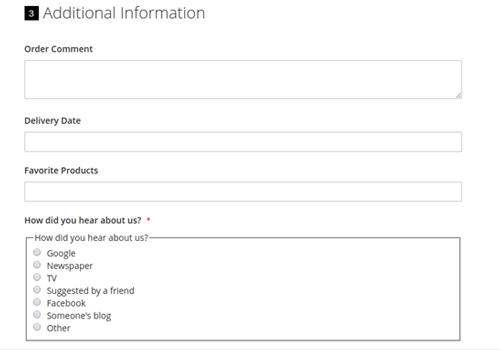 You can use the various input field types as textarea, date, dropdown, Yes/No Dropdown and multiple select dropdown checkboxes. 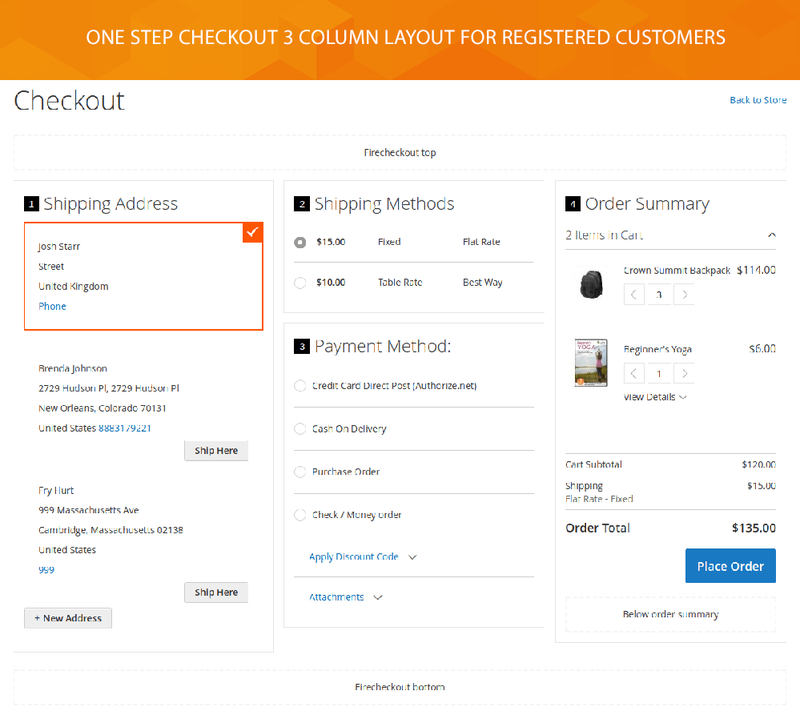 You can also set the label and a sort order for each checkout field. All fields will be shown on order view page and in the order email. I have a number of extensions on my website. I have been using Swissuplabs for a number of years now and have found their extensions are always updated quickly, easy to use and without issues. The value for money is simply unmatched. 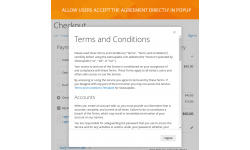 Support is amazing and very helpful every time i have used them. I wish all the providers of my extensions were the same. First, Mind Blowing Support, Developers are very friendly and make each single fix for conflicts in very little time. Second, No one in the market is providing these much extensions in this price. with awesome features. Cheers to Bogdan, who helped us a lot. Very good extension! works out of the box. We had litle problem with the installation, but support is superb. Whitin 1 min everything was fixed. Awesome extension and support Review by Michael Br. It’s all about the gifts! 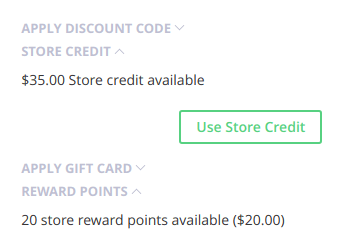 GiftMessages support added to the firecheckout page for both Magento Community and Magento Commerce editions. 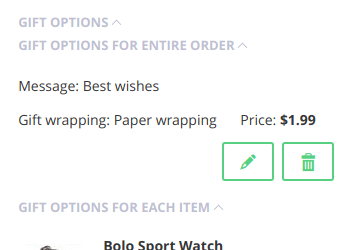 GiftWrapping, GiftRegistry, GiftReceipt, and PrintedCards support added for Magento Commerce Edition. GiftMessages support added. 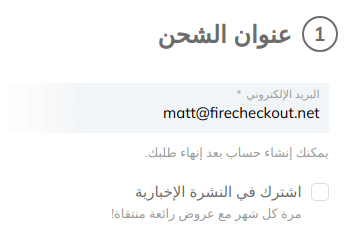 You can now edit them directly from the firecheckout page. Firecheckout page looks more structured now with the title above “Billing Address” form, checkout fields in “Order Summary” section, and compact mode to display saved shipping addresses. 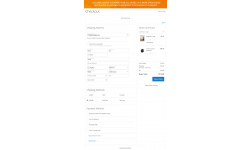 Firecheckout now triggers standard shipping validation when placing order. This makes it even fore friendly to third-party modules. 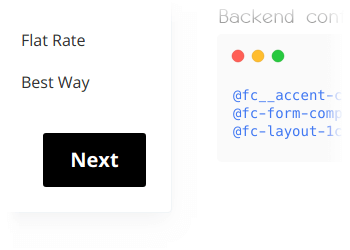 Fixed non working page preview functionality in backend, when backend and frontend has different timezone settings. 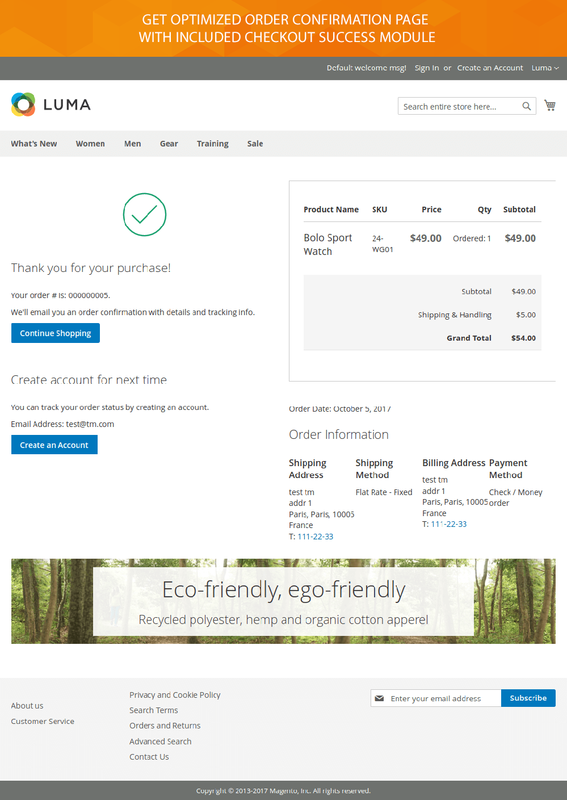 Fixed redirect to shopping cart, when using Magento 2.2.6 and 1column Multistep Layout. Configurable order review section added. Useful for EU countries. 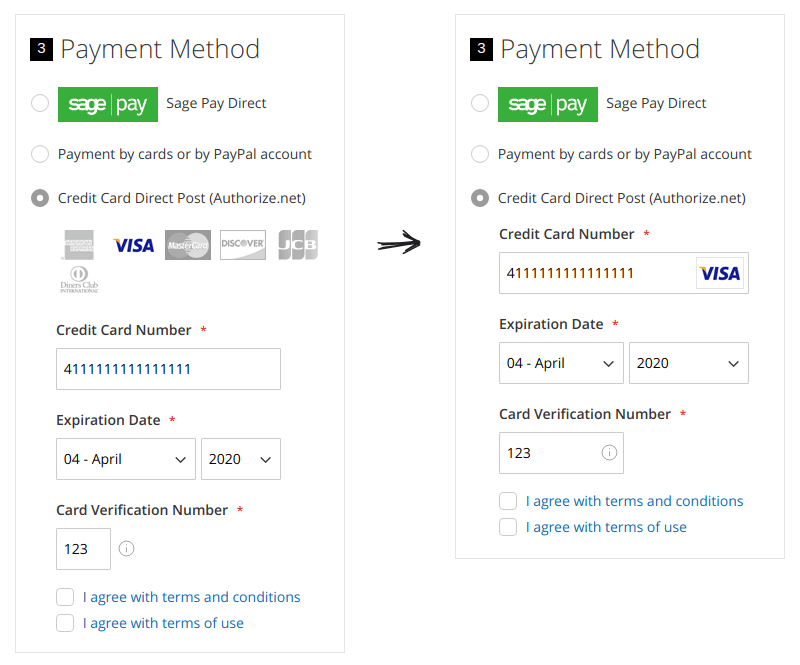 Improved credit card form styles for known payment methods: Authorize.Net, Braintree and other methods that use standard CC form markup. Improved “Sticky sidebar” performance, used for 1-column layout. Tons of tiny perfection improvements like vertical alignment between blocks, equal spacing around the elements and button-set alignments. 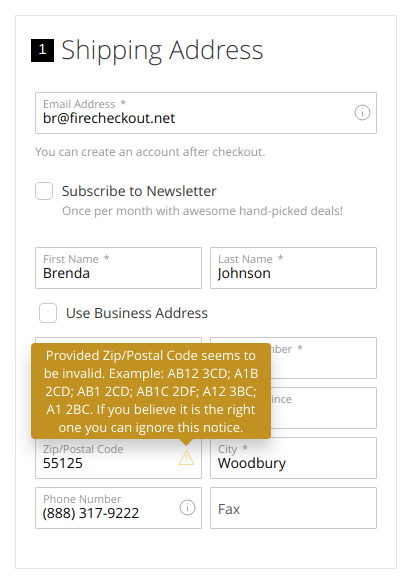 Firecheckout 1.12.0 brings more power to advanced users and developers who wants to customize their checkout pages. Customized field labels, placeholders, and sizes. Dependent fields are used for 'Use Bussiness Address' checkbox. 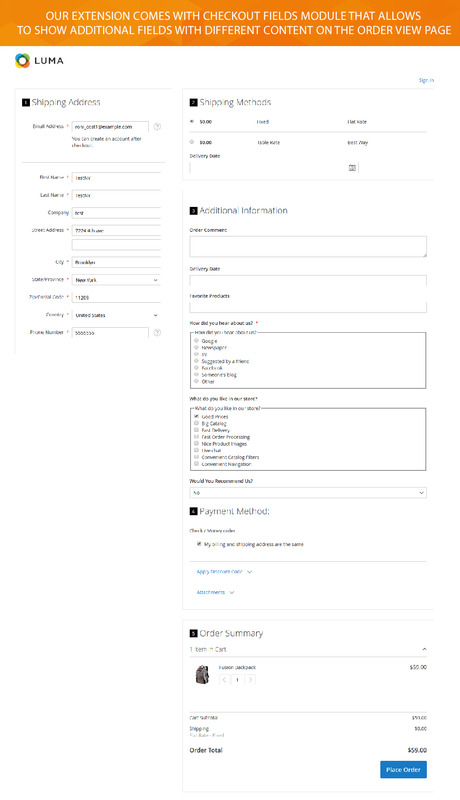 FieldManager that allows to change field Label, Placeholder, CSS class, apply formatter, validator, and much more. DependentFields utility that allows to setup dependencies between fields. You can show or hide some field, when other field/fields values matches some condition. FieldWatcher utility will help you to implement any specific logic with custom js functions. 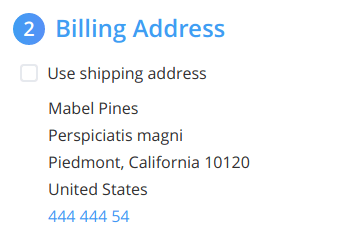 Three fields in a row in the address form when parent container is wide enough. More third-party themes compatibility. Had to increase the weight of CSS selectors with ID attribute to beat a bunch on Templates-Monster themes. 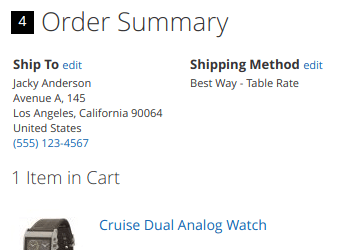 [dev] Xrayquire debugger added to quickly find out buggy modules that cause not working checkout page. Removed hardcoded dependencies from other checkout modules, so you can omit them during installation. 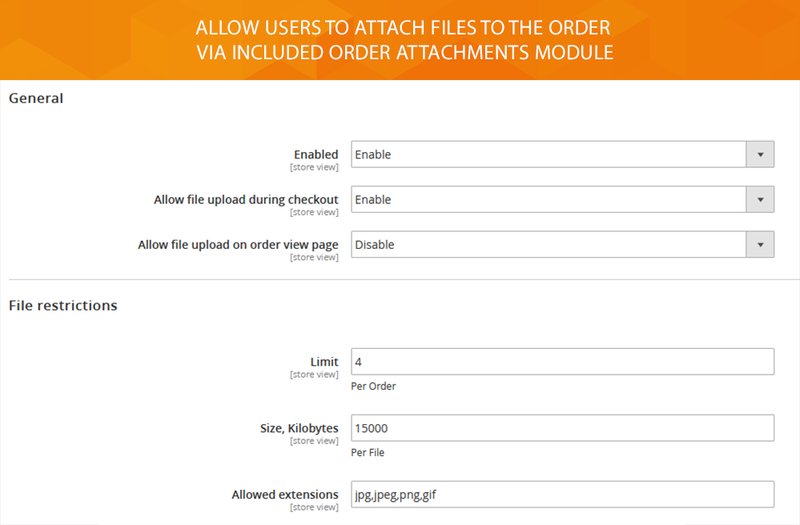 AddressAutocomplete DeliveryDate, CheckoutCart, CheckoutSuccess, OrderAttachment updated to the latest versions. 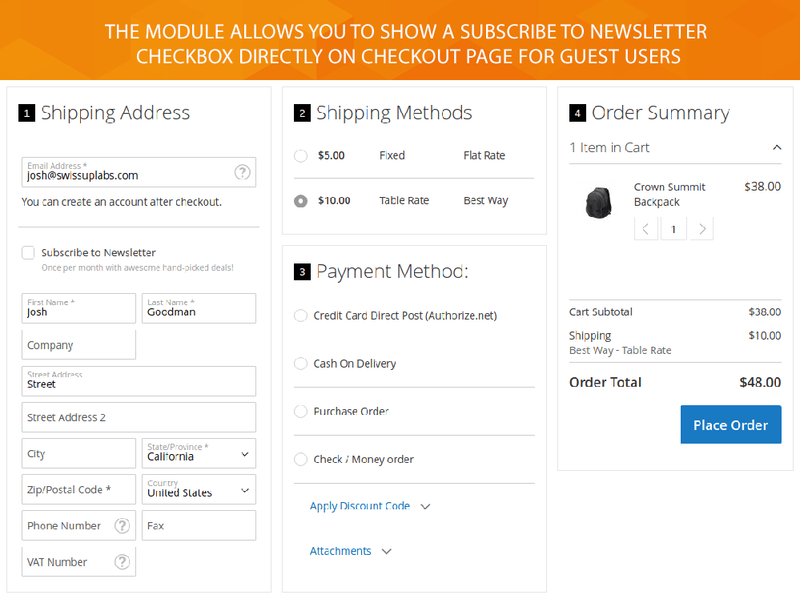 CheckoutFields module added. See the installation instructions on how to enable new module. Added additional less variables to simlify section numbers and blocks customization.See the list of all variables. 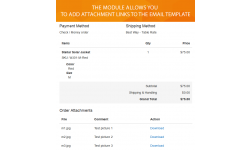 Checkout Cart module added. See the installation instructions on how to enable new module. 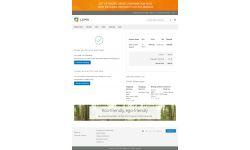 Delivery Date module added. See the installation instructions on how to enable new module. 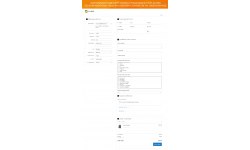 AddressFieldManager module added. See the installation instructions on how to enable new module. See the installation instructions on how to enable new modules. Just say you need third-party compatibility for free! If you require third-party modules in order to accomplish important tasks for your website - we do provide a support for them. Feel free to install extensions you can vouch for. We'll keep them up to date that will help you to maximize your store efficiency. Request third party modules integration for free! ©2019 swissuplabs.com. All rights reserved.